The meeting began with chanting of the Om, nine times. We are calling upon Cosmic Sai Baba to make his presence and we welcome his presence here. ❝Oh! I am here! And I am very pleased to be here. Thank you for calling upon me. You have had a lot of conversation this morning about many things – and many things that have given you insight about the existence of Spirit and your soul. Is this not right? For, all upon this Earth have a soul – and with each soul there is an agreement – and with the agreement, they come knowing who is to be their mother, and their father and others in the family. And perhaps – karmic records need to be balanced – and I say this with love. It is a way for all peoples upon this Earth to integrate and find unity; because when born into a family – the family is LOVE – that is automatic, it is blessed… from the souls of the parents and the child born into it. So that the love can actually help heal any karmic debt, if I can put it that way. So, My Dears, you have been talking about a very interesting subject and I would like to talk about this at another time. The agreement they have come with the Soul has made – between all – that they will help to bring unity to this planet Earth. And to find respect for one another; listen to one another … and perhaps differ with one another … but still be unified in that … … all—all that happens on the planet Earth is with respect; respect to the Mother Earth. And respect to your Creator, the Creator of All. This is a short message today, for Valerie (with her husband) is soon to travel to France, and to spend six months there. And for those that are listening to this message, she will be continuing to receive these messages from myself. And they will be placed on the website so that all can read them. But it would be difficult to receive letters so I would ask that please, people, not to write letters for a while – for six months. And to speak to me directly in their hearts. 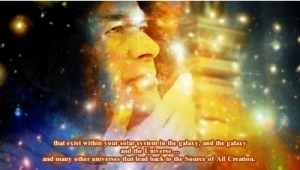 For as soon as anybody calls my name – Cosmic Sai Baba – I am there. It may be hard to believe this, but, if you practice it enough, you will know this. So please understand that all you have to do is call my name and I will be there. So today, I give blessings to the ones who have sent letters, and I would like them to know that they are in my heart. And I will care for them in every way that needs to be. So please reach out – and feel my Love. For my Love extends to all upon this Earth, this planet, and all living creatures – be they small or large. The Love goes out to all. I thank you my dear children, I thank you. I thank you.